Shivanya does tandav angrily in Shiv ji temple. Shivanya is praying that Shiv ji protects the Naagmani. She wants to get Naagmani which is away from Naags since 70 years. She dances to the extent that her feet starts bleeding. Shivanya wants Shiv ji’s third eye to open and Naagmani is seen. Shivanya gets to know someone is coming to kill Sesha. Shivanya sends Sesha and saves her life. Guru ji gets injured and Sesha does his aid. Shivanya and Sesha are worried that Ritik’s family can know Shivanya’s truth. Ritik asks his family not to doubt on Shivanya, and is confident that she is not a Naagin. Shivanya is called to give a test. Guru Maa attempts to reveal Shivanya’s truth by some rituals. Shivanya accepts that she is Naagin and shocks Ritik and his family. Roshni did not get her memory till now, but Roshni has feelings for Sid. Sid sings Janam dekhlo mit gai………… and gets closer to Roshni while her mehendi function is going on. It is Veer-Zaara moment for them. Roshni is imagining Sid. Roshni’s heart started loving Sid and she misses him in her mehendi ceremony. There is Sid and Roshni’s romantic song sequence. Roshni is marrying Kunal, but she has Sid in her thoughts. When the dream breaks, she wants to get off Sid’s name from her mehendi. Roshni mistakenly gets S written on her hand, and then erases it. Later, Sid takes new avatar in Roshni’s sangeet. Sid comes in disguise as a garba dhol player, and plays dhol. Roshni dances in full swing, and her sangeet ceremony goes well in Sid’s presence. Gopi is getting tortured by Premlata. Premlata gives her electric shocks and laughs. Gaura, Madhuben and Premlata bring Gopi to Kokila. Gopi and Kokila are captivated. They both are given shocks and tortured. Gaura asks who will save Modi family now. The three vamps are out in open and challenging Gopi and Kokila to protect their family. Sooraj and Sandhya dance in Chotu and Arzoo’s sangeet, and chosen Salman’s songs. They want to please Arzoo. Arzoo gets glad seeing Rathi family dancing on Salman’s hit songs. Sooraj and Sandhya dance on …unchi hai building song and have much enthusiasm and energy. Arzoo gets impressed by Rathi family. Babasa too shows his cool avatar to Resham, and Bhabho controls him. Babasa chooses Character dheela hai… song. Babasa tries to impress Resham by showing his dancing skills. 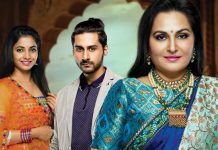 There will be big twist when Rathi family knows Arzoo is from Pakistan. Kanak plans Mata Ki Chowki and keeps Dhaani away from Viplav. Viplav’s friend spikes Dhaani’s drink. Dhaani gets dizzy and high after getting drunk. Dhaani gets away from the ashram and feels guilty that she got drunk. Thapki pacifies Dhaani and makes her relieve of her guilt, as someone tricked her and spiked the drink. Thapki encourages Dhaani. Kanak creates a big scene when Dhaani reaches ashram in morning. Kanak enquires about Dhaani’s night out and remarks Dhaani for spending the while night away from ashram. Kanak provokes the people and plans to burn the ashram to punish Dhaani. She plots all this to kill Dhaani in the fire. Rakhi Sawant will be doing an item song in Meri Sasu Maa. Rakhi has come in Pari and Sattu’s sangeet. She dances with Maa Saab. Pari has become bride and has nice bridal look. Rakhi dances on Aaj ki raat…. Maa Saab does not like dance and hates dancers. She gets shocked seeing Rakhi. Rakhi convinces Maa Saab for dancing and teaches some steps. All the bahus get shocked seeing Maa Saab dancing. Pari is happy that she is getting Maa, but she does not know she will get torturing Sasu Maa. Maa Saab surprises everyone. Thapki wins Suman’s heart by defending her infront of Sanjay’s NRI friends. Shraddha sees Thapki stringing hearts again and worries. Bihaan does not know Thapki is working as maid and asks her about the money Thapki has. Thapki hides about her earnings and paying daily rent of cowshed to Vasundara. Dhruv notices Thapki working as maid and gets upset. Shraddha distracts Dhruv and gifts him a wallet with her photo in it. Dhruv does not see Shraddha’s photo. Bihaan checks Thapki’s purse and finds more money in it, while Thapki is asleep. He wonders how is Thapki getting money. Thapki sends Bihaan away to hide her maid service in Pandey Nivaas. She asks Bihaan to find her missing earring. Dhruv’s wallet falls and Thapki helps him. She sees Shraddha’s photo which falls out of it. Thapki is glad that Dhruv is moving on. The show is going to air Mon-Sun from this week. Rambhateri who was always supportive of Raju, knowing he is her longlost son Raghu, now sides with Nandu. Rambhateri understands Raju’s plan to hurt Nandu by his mock love. Raju asks Nandu to accept her love for him, and scares her risking his life. While Nandu’s love is witnessed by Raju, he plans to break her heart to give her lifelong self humiliation of getting rejected by him. Rambhateri plans and makes Nandu show as if she does not care about Raju’s love-friendship fakeness. Rambhateri explains Nandu to hold her emotions as Raju is playing a bad game with her, which she did not expect. Raju wants to take revenge from Nandu, and does not know Raval planted fake Raju to molest-attempt on Nandu on lohri night. Raval provokes Raju for his love wrapped revenge. The show will have a time change and will air at 7.30 PM from 15th February 2016.